Learn more about the innovative Benzaco odor control technologies that let industry leaders focus on business operations - not odor complaints. The Problem: A Pennsylvania landfill using masking agents for years discovered how unsuccessful “covering” odors can be. The Pennsylvania Department of Environmental Protection documented over 200 odor complaints from neighbors of the landfill in just one year. 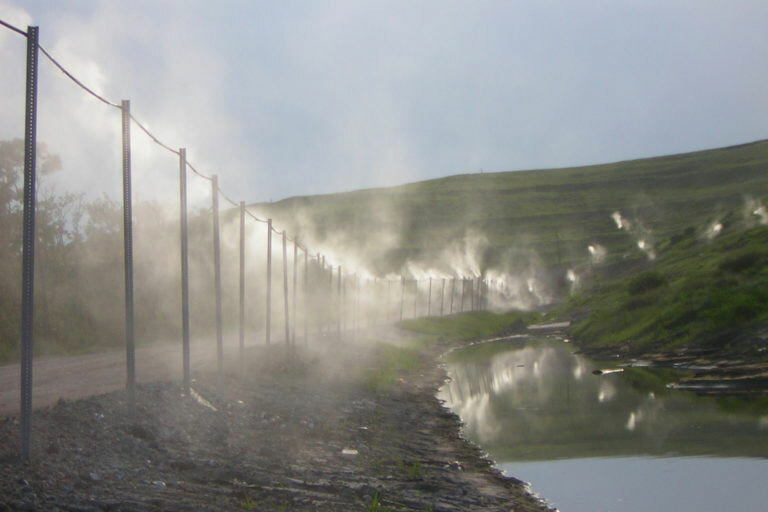 As a result and at significant expense, the site was required to install an enhanced landfill gas collection system with temporary flares to burn off the odorous gas. The site was fined almost $75,000 in civil penalties for past odor violations. Preemptive action on the part of the site to address odor issues would have reduced overall costs and alleviated the bad public relations suffered by the landfill. The Solution: The site has since implemented operational solutions, including the use of Benzaco Scientific vapor phase odor control measures which have reduced odor complaints significantly. The Results: Masking agents DO NOT WORK and may actually compound malodor issues and INCREASE odor complaints. Using a vapor phase odor control system, like the Benzaco Scientific Subtractive Odor Control system of products and equipment, that neutralizes NOT masks or covers odors will ensure Operational Acceptance and save costs. 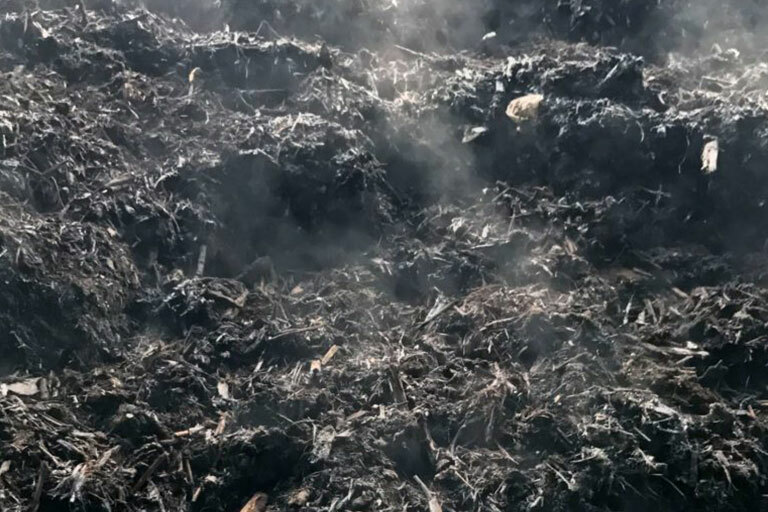 The Problem: Co-composting with sewage sludge caused sensitive odor issues at a California landfill. 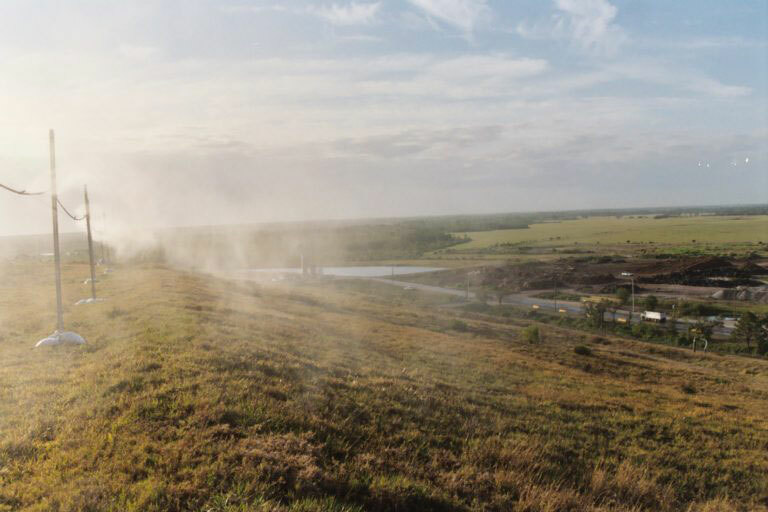 The handling and drying of the sludge, as well as regular landfill, refuse caused escalating complaints in an, especially environmentally conscious county. 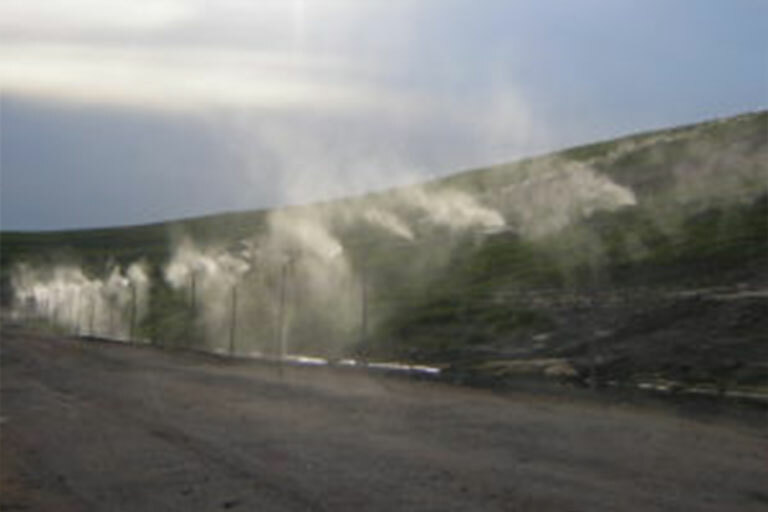 Since 1995, the landfill had been attempting to solve these nagging odor issues with a wide variety of odor control methods and delivery systems. The Objective: Design ONE system to eliminate the odor emissions from the VARIOUS individual operations at the facility. The Solution: Benzaco Scientific engineers characterized, quantified and prioritized the odor emissions emanating from the individual operations at the site. Based on this evaluation and the identification of specific malodorous compounds, Benzaco Scientific designed and piloted a high-pressure vapor phase control system operating at greater than 500 psi to deliver a complex essential oil odor neutralizing agent. The Results: Despite being initially skeptical, site personnel were impressed and convinced. The site installed three full-scale systems to cover the entire site. Since that time, odor complaints have dropped off from over 20 a month to less than 2 a year. More importantly, odor control costs have dropped dramatically. The facility was paying almost $200,000 a year for the previous unsuccessful system. Now, less than $12,000 per year. The Problem: Neighbors surrounding a southwestern Ohio landfill were outraged by the offensive odors emanating from the site’s sludge processing operations. The neighbors complained to local and state regulators every time a load of the offending material was delivered for processing. The site had to do something otherwise they were going to lose the lucrative sludge disposal contract. The Objective: Eliminate the odors, save the contract and maintain profitability. 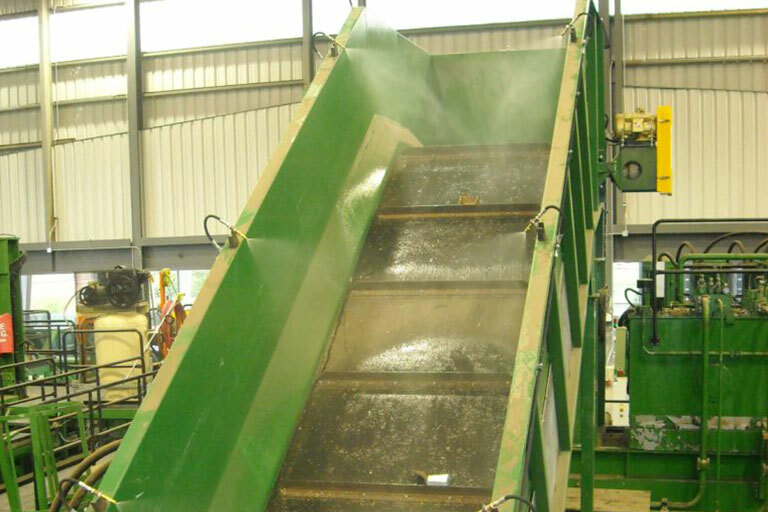 The Solution: The landfill’s internal odor experts suggested that the landfill operator contact Benzaco Scientific and enlist their aid to remedy the odor issue. The Benzaco team visited the facility, surveyed the operations, interviewed operating personnel and received an MSDS for the material in question. Based on these factors, the treatment plan was recommended and a trial began immediately with representatives from the local regulatory commission, the EPA and the hauling company on hand. The Results: The odor is gone! Thanks to a motivated landfill staff and inventive engineering for application from the Benzaco Scientific team, the odors have been eliminated. 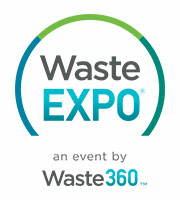 The landfill is now accepting up to six loads a day of sludge generating a high income stream. The Problem: Neighbors on the surrounding hillsides of this Northeastern Ohio sewage treatment plant were outraged by constant, intensely offensive odors from the plant’s sludge drying operations. The plant’s current treatment was providing only marginal success in controlling odors pouring from the exhaust scrubber. The plant was receiving hundreds of calls a week. The Objective: Eliminate odors; stop complaints. The Results: The odor is gone! No complaints! AND USE COST IS 33% LOWER THAN WITH THE PREVIOUS TREATMENT! The operations manager was ecstatic, "this stuff is liquid gold!" The Problem: The large California facility takes in a great deal of green waste (grass clippings, vegetable & fruit waste, leaves and other vegetation) and food processing sludge. It is all combined and recycled into high grade mulch and compost in their site composting operation. The nature of the waste and the composting process leads to the release of high concentrations of odor – especially during the turning of the wind rows. The plant was receiving numerous complaints from the neighbors and citations from the regulators. Already using a low pressure fogging system and product from another vendor, they were getting no relief. The Objective: Eliminate the odors; stop the complaints; stop the fines. The Solution: The facility was skeptical. Managers had heard it all before and were spending “too much money” on something ineffective. Benzaco engineers suggested an improvement in the system – high pressure instead of low pressure, to improve application and protability to allow treatment of specific areas at a time. Benzaco then suggested the use of OCC products which are very suited for odors stemming from composting applications. Skepticism remained, however. Benzaco Scientific products were 40% cheaper to use than the ineffective chemicals they were currently using! The Results: It was a no brainer and it worked! odor complaints were virtually eliminated and costs were reduced! Management was pleasantly surprised and ecstatic. The Problem: Increasing encroachment by new neighbors began causing problems for an Iowa pork processing facility. Though the plant had been there for more than 20 years, new neighbors complained about odors stemming from the waste treatment and composting operations at the plant. The “loud” and frequent complaints of the neighbors brought tremendous regulatory pressure down on the facility. Other odor control options had not worked for the plant. They had tried other methods and vendors to no avail, the odors and the complaints persisted. They needed to find a solution. The Objective: Create a treatment scheme for the waste treatment lagoons AND the composting operations that would eliminate odors and make the neighbors happy. 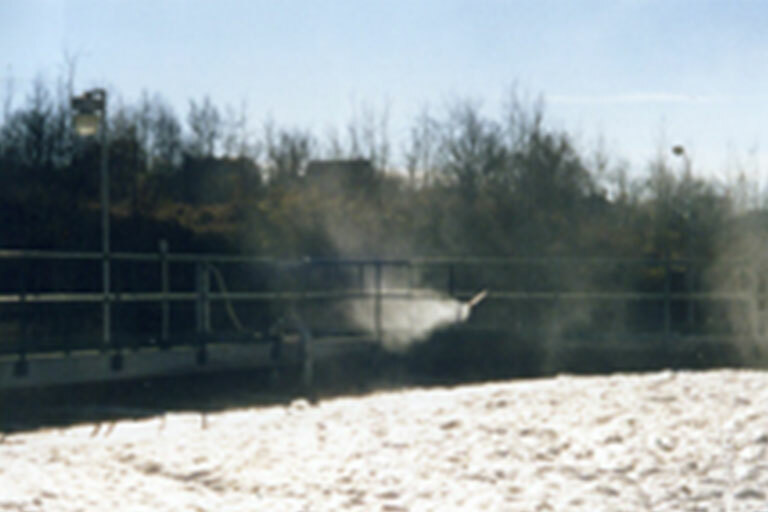 The Solution: After a plant survey, Benzaco engineers recommended a perimeter fogging system for the large 150′ x 400′ waste treatment lagoons that would utilize Benzaco’s unique OCC-2000F product blend of neutralizers and added fragrance. Benzaco also recommended OCC-Bel, a unique formulation of activated bacteria and enzymes, for topical application on the composting wind rows. The plant manager was skeptical, "We’ve heard it all before. It doesn't work for us." The Results: The Fourth of July weekend would be the test. Would the Benzaco solution work for the plant? Test results were ... A+! No complaints! The odor was eliminated. The Problem: Neighbors surrounding a pork processing plant in WI were militant about the constant offensive odors wafting into their backyards and businesses from the rendering operation scrubber stack. The plant controlled most odors from other parts of the plant through well executed housekeeping and operational procedures but had only marginal success with the scrubber – the largest and most problematic source. The plant received complaints on a daily basis. The neighbors involved local government to bring greater pressure on the plant. The local health department’s air quality regulators and the state EPA threatened fines. It was critical that the plant eliminate the odors and the complaints. Complicating the issue was a strong corporate agreement with their current national water treament vendor. Change would be difficult even though the program they were using did not work. The Objective: Eliminate the odors and stop the complaints in the most cost effective way possible. The Solution: Benzaco Scientific engineers reviewed the entire operation of the scrubber. To increase scrubber efficiency and reduce downtime maintenance, Benzaco suggested a comprehensive treatment scheme for the water side of the scrubber as well as ODOR-ARMOR® for the exhaust stack. Local regulators reviewed the Benzaco solution and gave their approval. The Results: The odor was eliminated! No complaints! Scrubber cleaning and maintenance was reduced to once per year from once per month. Total costs were reduced and odor control and treatment costs were cut in half! The water treatment vendor is still there but no longer treats for odor. The Problem: Since 1997, a Northeastern United States recycled paper mill has been under the scrutiny of the Department of Enviromental Protection (DEP) for odor complaints from the surrounding community. 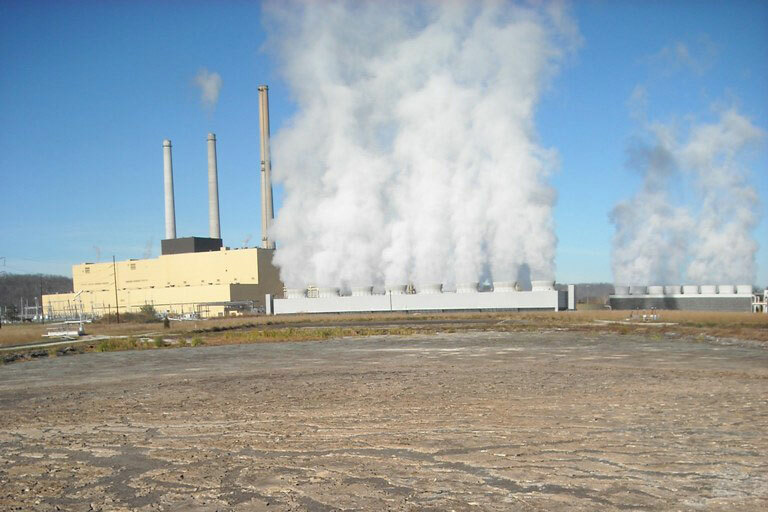 The neighboring community had the power to close the plant because of the smells. Either the mill resolved the odor problems or the DEP and the community would force the plant to close. The Objective: In an attempt to eliminate the source of the odors in the plant, the paper mill hired two enviromental engineering firms to recommend changes to the mill processes. In addition, the plant also began discussion with various suppliers for chemical solutions. The Solution: Benzaco Scientific engineers first addressed the bacteria issues in the plant’s million gallon water system. Site surveys showed bacteria levels were 1,000 times higher than the proper control range. Because of the fatty acids produced by the bacteria, they were a MAJOR source of the malodors at that level. In addition, certain parts of the system were anaerobic, leading to the generation of hydrogen sulfide gases (H2S). Benzaco Scientific’s suggested biological control program was effective in reducing aerobic bacteria by 85% and anaerobic bacteria by 99%. While the number of odor complaints were reduced significantly, occasional outbreaks of odor resulted in continued pressure from the community and the DEP. Even though biologically induced malodors were in control, other variables were contributing to the odor issues. Volatile fatty acids inherent in the recycled fiber and reaction products caused by de-inking and bleaching. To remedy the problem, Benzaco Scientific introduced ODOR-ARMOR® odor neutralization technology. Applied to odor vapors as an atomized spray using a high-pressure system, ODOR-ARMOR® reacts to alter the odor molecules, rendering them odorless and imperceptible. Spray nozzles were strategically placed to address problematic areas such as the aeration basin, clarifier, pulp dryer exhaust stack and exhaust fans for the roof and windows. Even the interior plant air was neutralized by applying ODOR-ARMOR® to the process chests and the "man-coolers" managing the air flow between floors. The Results: The Return on Investment (ROI) for this ODOR-ARMOR® treatment program is black and white. 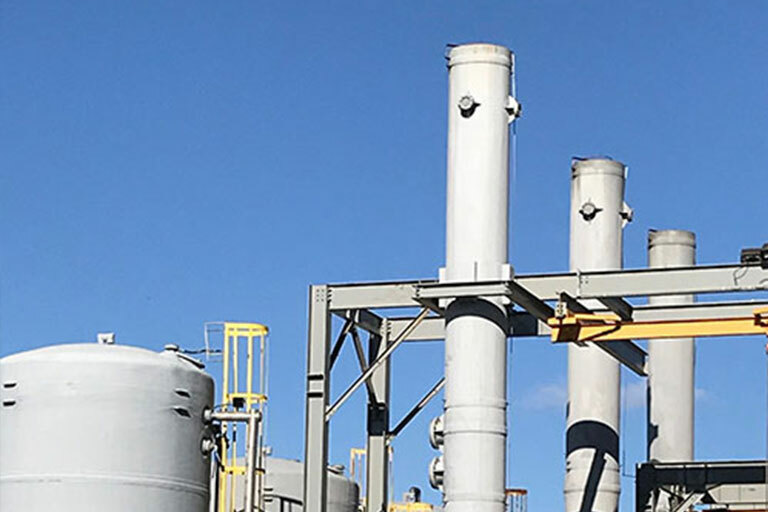 ODOR-ARMOR® treatment allows the plant to stay open by bringing the plant Operational Acceptance (the public’s permission for a facility to operate within a community). The plant manager recognized that as a result of Benzaco Scientific’s program and ODOR-ARMOR® technology, "we’ve come from a community ready to close our doors to an odor that’s barely perceptible over the course of three or four months and staying that way". The Problem: A licensed cannabis grow facility in the mountains of Colorado recently was saved from the imminent inevitability of being shut-down for persistent nuisance odor complaints from the neighbors. Although the owner had previously installed high-pressure fogging nozzles to treat odors from the greenhouse exhaust fans, odor complaints began to flood in…threatening the continued existence of the business. Contact-time of the counteractant with the cannabis odors. The Purpose: The purpose is to measure existence, strength, and characteristics of nuisance odors at the property line and the surrounding community utilizing Nasal Ranger® technology. 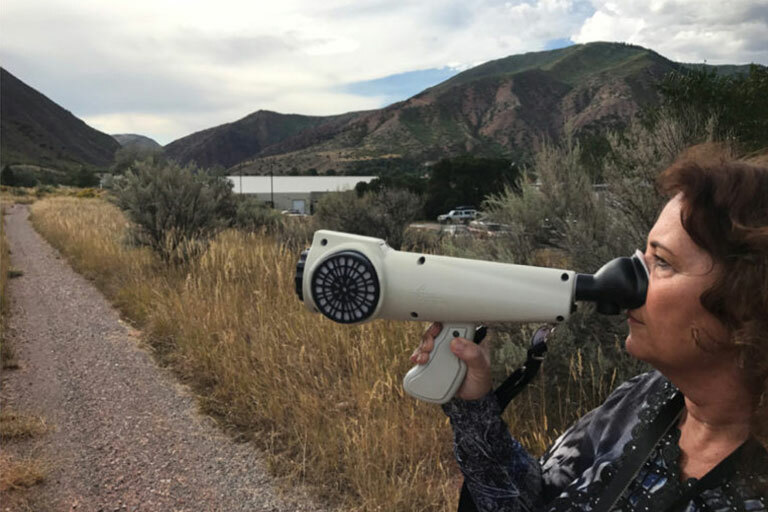 The Nasal Ranger® is a state-of-the-art portable, field olfactometer for confidently measuring and quantifying odor strength in the ambient air. Since the detection of odors is mostly subjective in nature, this device provides odor detecting and measuring values which determines ambient odor “Dilution-to-Threshold” (D/T) values objectively. The Solution: With a cooperative effort from both Fogco Systems and Benzaco Scientific, engineers designed and constructed diversion hoods over each greenhouse exhaust fan to minimize the effect of the strong cross-winds blowing across the fans. The hoods increased the contact time between the Odor-Armor® 420 and the cannabis odor. As a result, the subsequent odor mapping from the Nasal Ranger testing demonstrated “no discernable marijuana odor” at neither the facility property boundary nor in the surrounding community when Odor-Armor® 420 is treating the exhaust. The Results: Despite being initially very skeptical, both site management and the neighbors were now significantly impressed and convinced. Because this cannabis facility implemented an Odor-Armor® 420 odor mitigation program, odor complaints have dropped off from over 30 per month to less than 2 per year. And more importantly, this particular site narrowly escaped being shut down for odor complaints. Key neighbors who were initially in strong opposition to the cannabis operation had now written and submitted letters of support to the judge, ENCOURAGING a permit renewal. The use of Odor-Armor® 420, the Nasal Ranger® data, and the community letters of support was all enough to convince the hearing judge to rule: "Permit Granted." What makes Odor Armor® so different from other essential oil odor control products? How does essential oil technology work to eliminate odor? I've been told that essential oils are perfumes and fragrances; is Odor Armor® a masking type of product? What is the best way to determine if a product will work to eliminate my odor? How many others offer vapor phase technology? What do you mean “not a true neutralizer”? Is Odor Armor® safe to use? How quickly will Odor Armor® work? Is the same product good for all applications? Will Odor Armor® work under all conditions? Will Odor Armor® work on all odors? Can I test the treated air to determine effectiveness? What about winter operations, does the product freeze? What references do you have and what have you treated with your products? Can I add Odor Armor® to my system water to affect odor control? Can I add Odor Armor® to my sludge/compost/working face etc to affect odor? Can I spray Odor Armor® on odorous equipment and containers? I am considering using a scrubber on my exhaust gasses; do I still need to treat? Can I use activated carbon as a means of odor control? 1. What makes Odor Armor® so different from other essential oil odor control products? One of the critical things to understand about essential oil technology for odor control is that not all essential oils are created equal. Essential oils used in odor control are extracts of many different fruits, vegetables and other plant material. There are thousands of these oils available and many find their way into perfumes and fragrances as well as solvents, flavor enhancers, cooking oils and other uses. However, there are a very limited number of these oils effective for the process of odor elimination. The oils used in odor control display certain critical chemical properties that allow the oil to have a physical or chemical effect on odorous compounds. The effectiveness of any odor control product is directly dependent on how well the oils are chosen and blended to effect the correct chemical or physical reaction on those odorous compounds. Benzaco has spent years in pursuit of the IDEAL formula for odor control using essential oil technology. We believe that Odor Armor® is the best technology on the market today. Benzaco has developed a line of odor control products that is more effective, in terms of both odor elimination and cost effectiveness, than any of our competitors’ products. 2. How does essential oil technology work to eliminate odor? Three simple reactions occur allowing Odor Armor® to effectively and safely eliminate odors. The chemistry involved utilizes the unique characteristics of each oil in the product to optimize the simple reactions. The result is complete odor elimination without harmful byproducts or the use of hazardous chemicals. 3. I’ve been told that essential oils are perfumes and fragrances; is Odor Armor® a masking type of product? Many essential oils are indeed fragrances and are used in perfume formulations; however, not all essential oils are fragrant or used as fragrances. Odor Armor® is a blend of oils that though having some fragrance is not suitable to mask an odor. It simply does not contain a high enough level of fragrance to do so. Even at very high dosage without the presence of odorous compounds Odor Armor® is only mildly fragrant and the fragrance is nondescript. A masking agent is usually made up of one distinct fragrance that is readily detectable and increases in intensity as the dosage is elevated. Masking agents add to the overall odor intensity by introducing an odor stronger than the offending malodor resulting in an even greater odorous condition. ODOR ARMOR® IS TRUE NEUTRALIZING CHEMISTRY THAT REDUCES AND ELIMINATES ODOR. 4. What is the best way to determine if a product will work to eliminate my odor? The best instrument yet devised for odor monitoring is still the human nose. A simple lab test using a sample of the odor causing material and a dilution of Odor Armor® at the expected dosage for treatment is all that’s needed to get a good notion of whether the product will work. A simple testing procedure is available on request. Beyond that simple lab test, an actual trial on the offending area of the plant or site can also be arranged and easily accomplished with minimal expense. If the product is going to work either of the above methods will easily determine that. 5. How many others offer vapor phase technology? A number of companies operate in the odor control market. Those companies are scattered throughout the U.S. and are generally regional in scope. We are aware of 15 to 20 small companies offering limited products, equipment and expertise. Often their offering is not a true neutralizing technology, but a combination of masking technology, perfume and some degree of neutralizing capability. There are also a tremendous number of janitorial service companies that dabble in odor control. The offerings are usually masking agents. 6. What do you mean “not a true neutralizer”? Most companies offer a neutralizing product or line of products that are a blend of only a handful of essential oils. Often the primary component is pine oil or some other commodity essential oil. Though pine oil is effective in some cases, it falls far short of complete effectiveness. Because the products are not effective at odor neutralization, the products are blended to contain a fragrance to compensate for the shortfall. These products have limited applications and are not effective on most odors. In addition, the products require very high dosages to achieve even limited effectiveness, yet they often cost as much or more as Odor Armor®. 7. Is Odor Armor® safe to use? Odor Armor® is nontoxic, non-hazardous and absolutely safe to use. 8. How quickly will Odor Armor® work? Lab data has shown that the reactions occur within seconds of contact with odorous gasses and go to completion within seconds more. That means that you can be sure that the product will neutralize odor before it leaves your site thus eliminating odor complaints. Further, unlike masking agents, which can separate from the odor, the Odor Armor® reactions are nonreversible and will not separate from the Odor Armor® and cause problems downwind of the site. 9. Is the same product good for all applications? Odor Armor® is formulated to address a broad spectrum of odorous conditions because odors are seldom-simple one or two component gasses. The design of the product is such that it will effectively respond under changing odor intensity as well as changing odor characteristics. Because of this, it is unusual to find an application where Odor Armor® will not work. This also insures that you will not need to purchase multiple products for multiple odors. 10. Will Odor Armor® work under all conditions? As long as the conditions being treated do not change too dramatically from moment to moment, Odor Armor® will work beautifully and without much attention to the dosage. However, if there are large swings in odor causing conditions the product may need dosage adjustment, as would any chemistry that works by neutralization. 11. Will Odor Armor® work on all odors? In tests and applications, Odor Armor® has worked on nearly all odors. Some applications have required a different combination of ingredients because of a particular odorous compound. Benzaco can formulate to any application needing a unique product for odor control. 12. Can I test the treated air to determine effectiveness? No. There are no easy or economical ways to quantify the treatment. However, the best test is using your nose. If it works, you won’t smell anything. If it doesn't work, you will smell the odor. If it’s overfed you may get a slight smell of a nondescript fragrance. It is very slight but pleasant. If it’s underfed, you will get odor that will be at a reduced level from before treatment. In that case, all that’s needed is some slight dosage adjustment. 13. What about winter operations, does the product freeze? The product in its concentrated form freezes at about 25 degrees F but there is no detrimental effect on the efficacy or stability of the product. In its diluted form, the solution will freeze at about 30 degrees F. Since the diluted form is a water solution, it must be freeze protected by heat tracing if freezing is a potential. 14. What references do you have and what have you treated with your products? Benzaco has been in the odor control business for over twenty years. We have treated everything from smoke odor in airplanes to rendering plants to solid waste and sewage. We have extensive experience in odor control from every aspect - chemical, mechanical, equipment and application. We CAN engineer a solution to your odor control problem. References are available upon request. 15. Can I add Odor Armor® to my system water to affect odor control? Though the product can be used in the water phase it is not the most effective or economical method for its use. The chemistry of neutralization requires intimate contact of the oils and odorous compounds in the vapor phase. The volatility of the oils changes dramatically when added to a water stream. More product would be required to effect the same results as a fraction of product use in the vapor phase. It’s just not economical. 16. Can I add Odor Armor® to my sludge/compost/working face etc to affect odor control at the surface? Absolutely! Odor Armor® is an exceptional odor control agent when added to surfaces emitting odorous compounds. You would get excellent odor control as long as there was Odor Armor® present on the surface in question. Because the Odor Armor® would evaporate along with the odorous compounds, a fresh dosage should be added when odor returns. 17. Can I spray Odor Armor® on odorous equipment and containers? Yes! Surfaces treated with Odor Armor® remain odorless as long as the product remains on the surface. 18. I am considering using a scrubber on my exhaust gasses; do I still need to treat? Scrubbing is an excellent mechanical method of removing the bulk of the odorous gas coming from a process. However, there are certain limitations to scrubbers that one needs to consider before buying and utilizing a scrubber as a means of odor control. Is the odorous gas water soluble to the levels that are below the odor detection limit for that compound? What will be required to establish and maintain the proper water chemistry to allow efficient operation of the scrubber? What are my ongoing operational and maintenance costs? What will I need to do during scrubber downtime? The use of scrubbing can indeed reduce the requirement for odor control but often it will not eliminate it. The question then becomes which method is more economical and easier to administer or is a combination of the two the best way to treat? 19. Can I use activated carbon as a means of odor control? Activated Carbon can be a suitable means of mechanical odor control as long as the limitations of the applications are considered. Activated carbon is really only suitable for the elimination of hydrogen sulfide. Beyond that, the method either does not work at all or is severely limited in its ability to adsorb odorous gases. Processes that may have high voc content or are high in oils and greases also limit the carbon. Fouling of the carbon bed by the oils or rapid use of the bed capacity by the volatile organics would require frequent cleaning and regeneration of the carbon beds thus adding to the overall cost of the program of odor control.